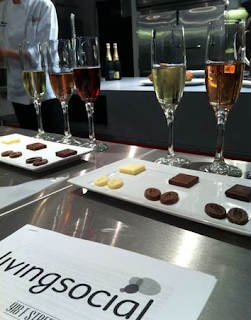 A Lesson in Chocolate ~ Learn, Live, and Explore! 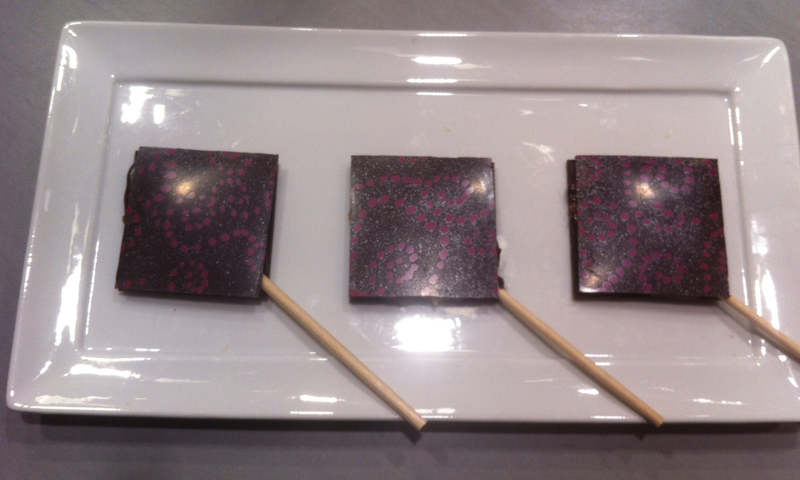 My friend and I shared a girls night out at the LivingSocial headquarters at 918 F. St. in D.C. learning about chocolate and making dark chocolate raspberry ganache lollipops with a chocolatier from D.C.'s popular chocolate restaurant, CoCo Sala. 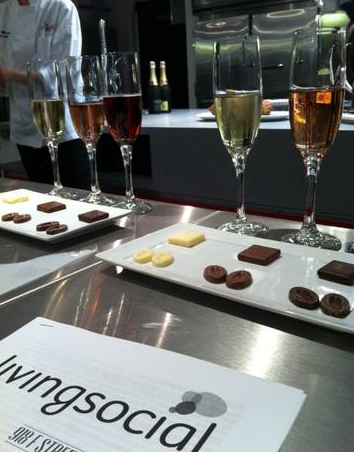 For the first half of the class, we learned how to properly taste and appreciate chocolate. Starting with the white chocolate, called Ivoire, we took the pastille and snapped it in half to observe how easily it breaks. Next, we took one half and rubbed it between our thumb and finger to smell the chocolate's aroma. Finally, actually tasting the chocolate was done in several ways: letting the piece melt in your mouth, chewing, using different parts of your tongue, pairing the chocolate with an appropriate sparkling wine or champagne, and even emulsifying the chocolate in your mouth with the sparking wine to create a ganache base in your mouth! The white chocolate was paired with a dry Perrier Jouet Grand Brut to balance the sweetness and butteriness of the chocolate. With the Jivara 40% milk chocolate, we sampled a sparkling rosé pairing, the Marquis de la Tour Remy Pannier. 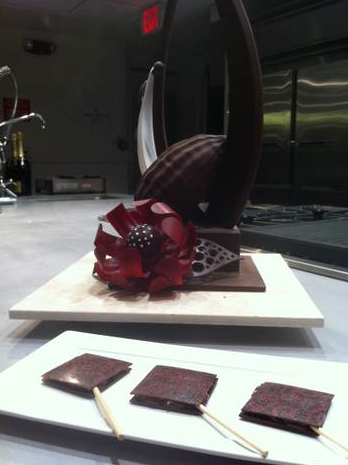 For the third combination, we had a Manjari 65% dark chocolate with a sparkling chianti, Banfi Rosa Regale. Surprisingly, the sparking chianti was very sweet, bringing out the dark cherry flavors of the chocolate. When finished with the official pairings, we played around to find the combinations that appealed to us the most. Before tasting the wine and chocolate, the instructor walked us through the chocolate production process. 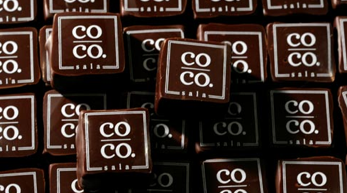 She first explained the varieties of chocolate plants, where chocolate is grown in the world, the composition of the three main types of chocolate, and cocoa solids vs. cocoa butters and their uses. Then she described production of chocolate itself, from mixing, pressing, and conching to stabilization using soya lecithin. Now that were were thoroughly educated, it was time to make some goodies. 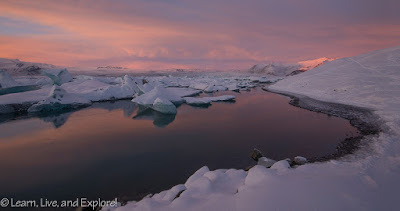 First, the cream, raspberry, and honey was brought to a light boil on low-med heat, making sure not to scald the milk. The hot mixture was then poured in the heat resistant container (think tupperware) with the dark chocolate pastilles, and then the two components were stirred until well blended. The hot ganache has to cool to a temperature where it can except the butter, so this free time allowed us a chance to continue to sample our sparkling wine and chocolate samples. As the ganache cooled, we observed some fat separation, but were reassured that once the butter was blended in using a hand blender, it would all cream together as desired. 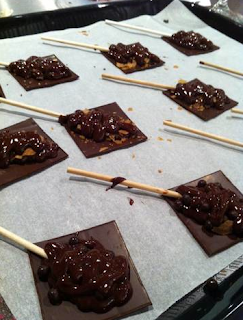 Once the ganache was complete, we had to let it cool further in order to get it to a temperature where it would not melt the tempered chocolate squares that were to be the outer layers of the lollipop. Using a piping bag to apply the ganache to the back of the decorative squares, we then sprinkled some goodies (mini whoppers, crispies, and chocolate nibs) on the ganache, placed a lollipop stick down the center, covered both in another strip of ganache, then layered the other decorative square on top. Pretty simple for such a decadent treat!